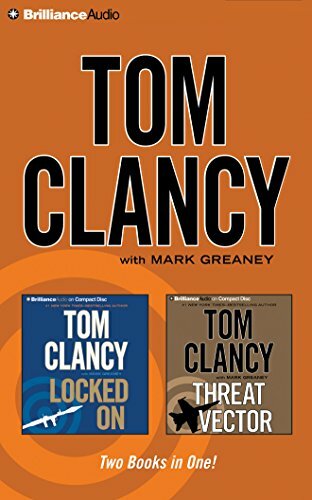 Two Tom Clancy thrillers together for the first time in one collection. Although his father had been reluctant to become a field operative, Jack Ryan Jr. wants nothing more. Privately training with a seasoned Special Forces drill instructor, he’s honing his skills to transition his work within The Campus from intelligence analysis to hunting down and eliminating terrorists wherever he can—even as Jack Ryan Sr. campaigns for re-election as President of the United States. But what neither father nor son knows is that the political and the personal have just become equally dangerous. A devout enemy of Jack Sr. launches a privately funded vendetta to discredit him by connecting the presidential candidate to a mysterious killing in the past by John Clark, his longtime ally. A shadowy mercenary team is dispatched to capture the former Navy SEAL. With Clark on the run, it’s up to Jack Ryan Jr., along with Ding Chavez, Dominic Caruso, and the rest of the Campus team, to stop a threat emerging in the Middle East: A corrupt Pakistani general has entered into a deadly pact with a fanatical terrorist to procure nuclear warheads, which can be used to blackmail any world power into submission. With the breakneck speed and military action scenes that have made him the premier thriller writer of our time, Tom Clancy delivers a novel of high-tech warfare in which the enemy within may be even more devastating than the enemy without. Jack Ryan has only just moved back into the Oval Office when he is faced with a new international threat. An aborted coup in the People's Republic of China has left President Wei Zhen Lin with no choice but to agree with the expansionist policies of General Su Ke Quiang. They have declared the South China Sea a protectorate and are planning an invasion of Taiwan. The Ryan administration is determined to thwart China’s ambitions, but the stakes are dangerously high as a new breed of powerful Chinese anti-ship missiles endanger the US Navy's plans to protect the island. Meanwhile, Chinese cyber warfare experts have launched a devastating attack on American infrastructure. It's a new combat arena, but it’s every bit as deadly as any that has gone before. Jack Ryan, Jr. and his colleagues at the Campus may be just the wild card that his father needs to stack the deck. There's just one problem: someone knows about the off-the-books intelligence agency and threatens to blow their cover sky high.